Cassini continues to deliver. 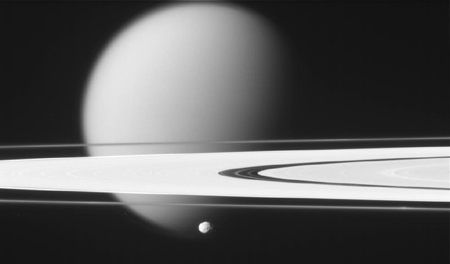 That astonishing image shows the rings of Saturn, with the giant moon Titan in the background, and the tiny moonlet Epimetheus in front. What a vista! Look at the differences in scale: Titan, at 5150 km across, is bigger than Mercury. The rings are 250,000 km from edge to edge, and wee teeny Epimetheus is 115 km across (our own Moon is about 3500 km). There's just nothing like this that you can see from the Earth. Our Moon is pretty cool and all, but Titan has an atmosphere (twice as thick as Earth's!) and is as big as a planet. Epimetheus is oblong and pitted and weird-looking. And geez, rings.